Many members of the millennial generation are fast approaching the need to find full-time employment. Today the job market is more competitive than it has ever been, so it is exciting for job seekers to learn about fields with a large number of job openings. Skilled trade jobs fit this bill perfectly. Skilled trade jobs include a wide variety of professions such as electrician, plumbing, auto mechanic, or construction. While these professions don’t require a four-year degree, most do require some sort of apprenticeship or certification. Even though these jobs don’t require a four year degree, they pay well for those who are good at what they do; some skilled trade workers earn as much as six figures yearly. Positions for skilled trade jobs are opening rapidly as the large numbers of baby boomers, or the generation born after World War II, begin to retire. The end of World War II caused a rapid increase in births which created a population spike. As this generation entered the work force the majority entered into skilled trade jobs as they usually followed the trade of their parents before them. Today, the baby boomers have nearly all retired, or are looking to retire, leaving firms struggling to fill these skilled trade positions. With baby boomers leaving these professions, it gives those considering any field mentioned above a very positive outlook. Many baby boomers entered skilled trade professions due to relatively easier entrance requirements. At the time, a four-year college degree was not easy to come by. Only privileged families could afford the time and money it took to earn a four-year degree. Baby boomers often had families to support and needed to earn money at a very young age. 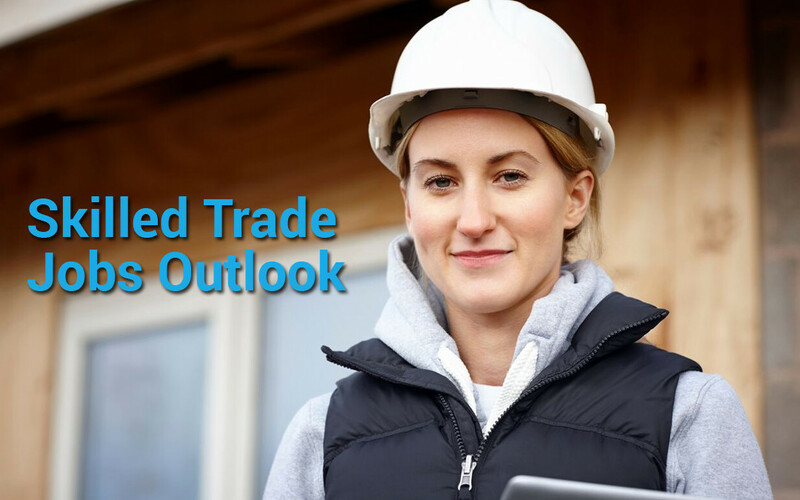 Skilled trade positions provided a healthy living without the delayed results and expenses of a college education. The Bureau of Labor and Statistics’ most recent estimate for the number of baby boomers in construction and extraction occupations is about 5,088,030. Electrical and Electronics Repairers are currently the oldest professions with 72% of the workforce over 45 and 30% over 55. As more and more of this generation continue to retire it is leaving a void in the work force, a void that young workers need to fill. Just because there are a lot of positions to fill does not mean that these jobs will be easy to obtain or adequately perform. Baby boomers are known for their amazing work ethic and firms are struggling to replace not only the number of workers, but the competence and work ethic of those employees. You might also be asking why it is the skilled trade jobs that are suffering. What about the baby boomers that took white collar, desk jobs? As much as those jobs are struggling to fill positions they have a larger population to choose from. More and more millennials choose to get a 4 year degree and go to college. They are looking for more incentives, benefits and better pay. Today the business job market has become much more competitive than that of skilled trade jobs. This opens up more opportunity for those who are not interested in white collar careers. However, this does not mean that trade jobs have less pay or less benefits. Younger generations of skilled trade workers are beginning to speak up, where the older generations did not tend to be as vocal about these concerns. Employers of these skilled trade jobs now understand the need for incentives and benefits in order to obtain a more dedicated work force. In total, an estimated 31 million positions will be vacant by 2020. The starting pay for these jobs will provide a comfortable living. Electricians, for example, can have a starting pay as high as $60,000 which is the same or higher than positions that require a 4 year degree such as an Accountant or Marketing Research Analyst. Encouraging students to consider trade schools over universities is important in filling the gap created by millennials. If school, studying and exam taking were never really your thing that is okay. The requirements for skilled trade positions place more emphasis on on-the-job experience and training. When you go to a trade school you learn less from a book or lecture and more from hands on experience in whichever trade you choose. That does not mean that there are absolutely no tests; some positions do require you to take a test to become certified for that position or field. Plumbing: For plumbers, apprenticeships are the preferred method of training. During a plumbing apprenticeship, which should last between four and five years, an apprentice will earn about half of the wage of an experienced worker. They will also receive classroom instruction during this time. Electrician: Electricians are also usually trained via apprenticeships. The programs include 144 hours of classroom training and 2000 hours of on-the-job training. Students have the option of specializing in areas such as maintenance, electrical fitting or construction. In addition to apprenticeships, students also have the option of trade school training to be an electrician, which allows them to command a higher starting wage than those who don’t. Auto Repair: Many of those in the auto repair profession learn through on-the-job training with those who are experienced in the field. They may work under those in private businesses or more formalized training at a dealership. Some companies sponsor two-year programs offered at trade schools. Construction Management: Many construction management programs are available at two-year colleges. Construction industry associations also offer training opportunities. Unlike other trade programs, construction management programs are also available at some four-year colleges and universities. In this case, a four-year degree may create more employment opportunities. Some job directory sites specialize in providing a platform for skilled trade workers to find employers who are hiring. Here is a list of job directory websites to help you jumpstart your career. TradedUp.com is a job directory website that lists contract, temporary and permanent skilled trade jobs for a wide range of professions. They provide detailed data regarding the duties and qualifications for each type of job as well as background information about the employer. You can apply directly on TradedUp.com by including your contact information and uploading a resume and an optional cover letter. If you have additional questions about the job, many listings also include the employer’s number or email address. At TradedUp.com, you’ll have the opportunity to shortlist specific jobs that you’re interested in and may want to revisit later in time. You can also create an account and keep track of the jobs you’ve applied to as well as your interests. If you’re specifically looking for HVAC jobs, consider creating an account with HVACAgent.com. Many of the top HVAC employers list open jobs on this website. You can apply directly for listings and use the company’s JOB Match tool to help you locate the best jobs that fit your skills. With this free tool, your profile will be automatically submitted to prospective employers. ConstructionJobs.com is a leading site that allows aspiring construction laborers to browse jobs in different areas and submit resumes to employers. They offer an easy resume management system, where you can create and update your resume. You can also sign up to receive daily or weekly construction job postings in your inbox. PlumbingJobs.com offers a variety of job postings for employers and individuals looking to hire plumbers for one-time projects. You can create an account and browse jobs in different cities. PlumbingJobs.com provides online tools that allow applicants to post their resumes online. Just like with getting a four year degree, it is never too late to start in a trade school. However, the earlier you start the earlier you can get through your apprenticeship and the earlier you can move up in your profession.